We are living in a state of great flux. Needless to say, political, social, economic, and technological structures are changing faster than we can name and define them. As educators, we are called upon to ready adults for the challenges brought on by global changes. Educators in the 21st century are no longer knowledge producers and disseminators. Educators are involved in managing the educational process: their own and that of the adult students. Educational leadership in the knowledge society is evidenced with a curiously mixed set of skills; it is defined by emotional intelligence and spirituality; it is defined by the finely honed ability of facilitating learning in cross-cultural, multi-lingual, and inter-disciplinary settings; it is defined by a willingness to move away from the guru-stance of teaching and toward a praxis of partnering for change. Today’s educator ought to be a strategic partner in the lifelong and life-wide process of learning. This chapter explores the multi-dimensional role of educational leadership, which is characterized by interdependence and calls for research on collaborative and contextual paradigms in higher education development, delivery, and management. At the root of this chapter is the premise that education is a human right and that institutions of education ought to be accountable to the learners, and serve learners within the highest, professional standards toward achieving sustainable social, civic/political, and economic access to the better life we claim higher education can provide. Within our so-termed international knowledge society, teaching within a lifelong learning context has been viewed from so many angles that clarity of approaches to education programming is often lost in the Tower-of-Babel discourse on education management. Although education for all is seen as pivotal for sustainable economic development and peaceful social co-existence of the many peoples in our world, transnational designs at providing access to sound education, training, and development have not had the anticipated impact. Universities continue to be tasked with providing the evidence for sound higher education management through research on best practices of program development and delivery. The preparation of administrators and instructors located within academia all too often does not include experience in real-life settings to appropriately familiarize prospective educators with the issues and needs of disparate stakeholders in learning settings around the world. A dominance of thought and perspective reproduces education structures globally and has led to the silencing of alternate approaches that are based on non-traditional perspectives, which might add richly to the discourse and theory building. A praxis is needed that sustains the very sustainable community development we seek through education and training endeavors. In the historical sense, universities are defined as the places of knowledge production and dissemination, teaching and learning, and theory building that informs the practical in society1,2. This needs to be revisited on two levels to determine the crucial roles that such entities ought to play in our changing and varied reality. One level is the assumption that knowledge is produced through the established protocols, which are gate-kept in academia; and the other level is what kind of knowledge is to be researched: that of content, process, or context of educating. Clarifying and defining need to be done by, with, and for all stakeholders. Higher education institutions are notorious for their limited willingness and capacity to change and to change in a timely manner; and with that, universities as creators and disseminators of knowledge are vulnerable to being out-voiced by vendors of educational products, particularly by those hawking technology-based one-size-fits-all solutions. 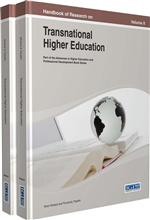 This chapter offers a critical perspective about current approaches in education program development and implementation within the context of the reality of higher education practices as I have experienced and evaluated in Afghanistan, China, Thailand, and Kenya. By example of work on the ground in these countries, needs, challenges, and strategies for successful collaboration across countries and cultures emerged. In these countries as much as the inner city, disfranchised communities in the USA where I work, I saw how keenly education workers seek to engage ways to pose and solve problems that plague their everyday existence as much as that of their learners. When workers in the communities collaborate to develop transnational higher education programming much is learned by all involved. It is often through cross-national and intercultural exchanges and experiences that one’s own reality becomes more sharply visible. This chapter is based on my participatory action research in these countries since 2006 and my work on the blended shore education concept (Strohschen, 2009). I hope to offer real-life, current, no-nonsense strategies for consideration. The blended shore education concept provides the theoretical framework as it teased out principles and key approaches to successful transnational education program development and delivery that can sustain community development and lead to empowerment of individuals and community. Fundamental to this blended shore education concept are the principles of popular education and critical theory as espoused, for example, by Freire (1970), Nyerere (1977, 1979, 1978), Brookfield (1995), Habermas (1970, 1971, 1971a, 1973), and Cervero (2000). Metagogy: It is a process of collaborative learning amongst adults that works on interdependence of learning for the advantage of the individual as well as the community. Blended Shore Education: It is a framework that guides educators in developing successful collaborative, interdependent program development and delivery practices across cultures and nations. Instructional Design: The process of identifying learning needs and development learning material in order to improve instructions to the learners. Andragogy: Learning strategies developed for educating adults. Adult Education: It is part of extension education which is aimed at educating adults including educating at work place. International/Intercultural Education: Education across borders and cultures.